To suggest additions, please email Kris Adams Wendt at kawendt@wvls.org. Registration may be done by mail or online up to 20 days before the election. Voters may register in person at their municipal clerk’s office up until the Friday before the election at 5:00 p.m. or close of business, whichever is later. Voters may also register at the polls on Election Day. Proof of residency must be provided in all cases. For additional information see also Bring it to the Ballot Voting in Wisconsin and The Voter Photo Identification Law. LWVNOW, a chapter of the US and Wisconsin League of Women Voters, is a nonpartisan political organization that neither supports nor opposes candidates for office at any level of government. 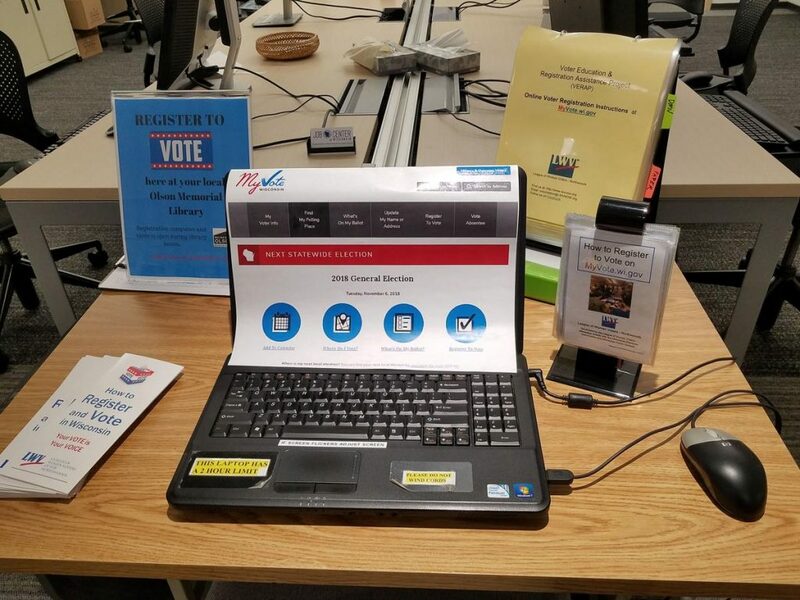 VERAP was inspired by collaborations between the Kenosha Public Library and their City Clerk’s office; and by the LWV of Milwaukee County, Milwaukee School District and the Milwaukee Elections Commission. The intent is to distribute VERAP tools statewide. Nearly 2,900 partners participated in National Voter Registration Day last year. 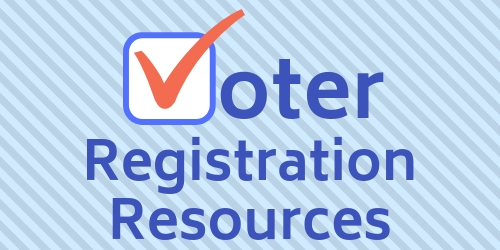 Almost 125,000 citizens registered or updated their registration on National Voter Registration Day. Since the day was founded in 2012, more than 1.6 million voters have registered. Spark: ALA joined the Harry Potter Alliance in an 8-part video series targeted to first-time advocates aged 3-12. 50 Stealable Grassroots Marketing Campaigns Ideas from professional grassroots marketing campaigns, with verified success metrics provide confidence and ideas for optimizing advocacy, growing donations or enhancing membership growth and engagement in local projects. Includes “1,190 Tweets to Congress in Two Weeks” – ALA’s 2016 campaign to encourage Members of Congress to support school library programs by reauthorizing ESEA – and recommended by ALA to state library associations. The Congressional Research Service (CRS), a division of the Library of Congress, is Congress’s think tank, researching and compiling nonpartisan reports on a governmental issues. This site, with bi­-partisan support, make these reports available to the public. Updated regularly. More than 228,000 hours of video (just about everything that has ever aired on C-SPAN), updated on a daily basis. Historical content includes debates, speeches, rallies, and more. Users can create custom video clips to save and share. Essential. Code of Ethics of the American Library Association. IFLA Code of Ethics for Librarians and other Information Workers (International Federation of Library Associations). 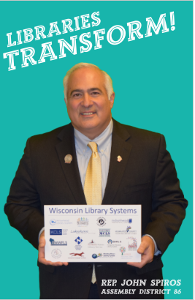 WVLS librarians are continuing to provide legislators serving districts that include all or portions of WVLS counties with opportunities to learn more about the way Wisconsin libraries transform their communities. 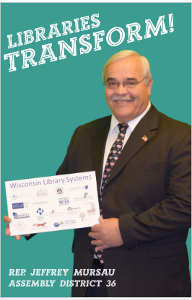 Funding to support WVLS and its sister public library systems across Wisconsin is appropriated through the biennial state budget process. A new state budget will be written in 2017. 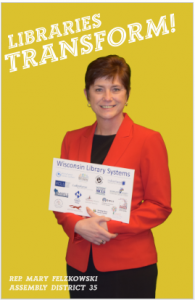 The Wisconsin Library Association (WLA) began its Libraries Transform! 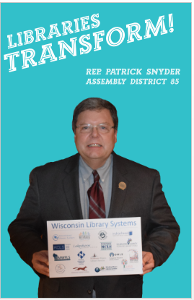 poster project in 2016 as part of the association’s 125th Anniversary, and as a vehicle for building relationships between legislators and libraries. WLA’s goal is to create and maintain a complete set of legislative posters for display in local libraries. The project is based on the American Library Association’s Libraries Transform Campaign. (Above) Representative Jim Edming visited the Frances L. Simek Memorial Library in Medford to receive his Libraries Transform! poster from Taylor County library directors Carla Huston (Stetsonville), Denise Korenuk (Gilman), Tammie Blomberg (Rib Lake), and Erica Clarkson (Medford). Candice Celestina-Smith (Westboro) not pictured. 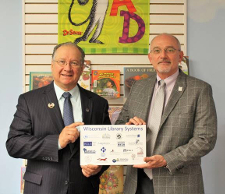 (Below) Senator Jerry Petrowski at the downtown Wausau branch of Marathon County Public Library with Director Ralph Illick on the day the Senator’s poster photo was taken. 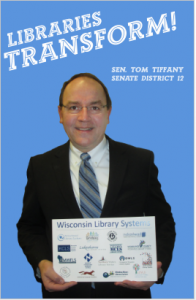 The large library card featured on each poster includes logos from all the public library systems across Wisconsin. It is symbolic of the fact that legislative districts frequently include portions of counties from more than one public library system. Completed Posters are available for these WVLS area Legislators: Representatives Bernier, Edming, Felzkowski, Kulp, Mursau, Snyder, Spiros, Swearingen, and Senators Petrowski and Tiffany. A poster for Senator Moulton is pending. 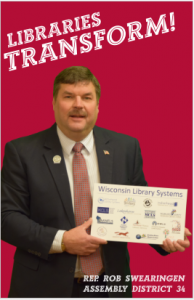 Additional copies of each poster may be purchased for display at local libraries (a friendly welcome when legislators return for a listening session or office hours) for $20 by contacting the WLA office at 608-245-3640 or wla@wisconsinlibraries.org . Send us your “Libraries Transform!” News! 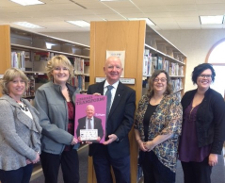 Do you have stories or photos of legislators’ visits to your library to share? Do you have questions about the Libraries Tranform! poster project? Contact Kris Adams Wendt at kawendt@wvls.org.